Philips has transformed the Business Center OLED Lighting into a Global Business Unit OLED. They tell us that this emphasizes the importance of OLEDs within Philips. Kristin Knappstein, Head of Business Creation in the OLED unit has kindly agreed to answer a few questions we had. Q: Hi Kristin, and thanks for your time. You have launched the first Lumiblade panels back in 2009. How's the response so far? The first Lumiblade panels were already available in 2008 through our Technology kit, which was very well sought after. Since then we have had constant request for panels in all shapes and sizes. Today, people not only can order from from our webshop a wide array of standard panels – which are delivered in our Lumiblade Experience Kit – but also our Lumiblade modules and moreover Lumiblades of individual shapes and sizes by contacting us. Reactions have been very positive and inspiring to us. General statements by our customers are that it is good to have a brand new technology accessible the way we as Philips give access to it. As for a customer driven company it is our strategy to have this feedback in order to align our products with the customer needs. Q: You have recently installed 800 panels in the Austin-Martin show room. Do you have other big installations? Can you tell us why people are choosing to use OLEDs? Jason Bruges, who made the art installation for Aston Martin, also used around 150 of our Lumiblade OLED panels for his installation Mimosa, which we showed this year at the SuperStudio in Milan. In addition, the British designer-artist collective rAndom International made the interactive installation “You Fade to Light” with more than 900 of our Lumiblade panels. A limited edition of this installation is commercially available and has been sold to people who love OLEDs for their innovative character and surprising light effect. Q: What markets are you currently aiming for with those sample panels? Since the OLED technology is a rather new technology and we are still some time away from mass production and mass prices, we target at this time the high-end design luminaire market as well as the art installation market. “Edge” by Established & Sons as well as “O’Leaf” by Modular – the later being the first off-the-shelf OLED product worldwide – target already the market for decorative luminaires: well designed, at affordable prices. In the coming years we already see this shifting more towards medium segments in this market. However, it will still take a little bit of time until OLEDs will be an everyday-household lighting product. Q: You are still only making 'sample' volumes. When can we expect volume production and more down-to-earth prices? Production picks up momentum while we speak. “O’Leaf” by Modular and “Edge” by Established & Sons are designed as volume products: “O’Leaf” e.g. costs the end-user around 1.200-1.400€, which addresses still an up-market segment but sells one order of magnitude lower than the objects we have seen in the market so far. The era of affordable lamps in larger amounts has already begun and we see this path opening very soon also for other players and designs. Q: How much does the "Edge" cost? The “Edge” is a design collaboration between Philips Lumiblade and Amanda Levete for Established & Sons. This desk lamp will be sold via the webshop of Establish & Sons and will cost approx. 2.200 Euros. Q: Can you update us on the Lumiblade Creative lab? Do you have new designs coming from it? The Philips Lumiblade Creative Lab is a great success with designers, architects and luminaire producers. People have the chance to experience the new light source OLED live and to come up with new designs and forms of applications. We have several projects going on at the moment but it is too early to give any details right now. However, as of January we offer free workshops for e.g. target groups like designers or architects in whom they can get their hands on OLEDs as well meet our specialists. Q: In September you showed the world's first mains-powered-OLEDs. When can we expect such technology to be commercialized? What applications do you think can use such devices? Q: We know that OSRAM is building a pilot line with a $70 million investment. Other companies also plan large investment. Will you follow suit? Philips is leading the commercialization of OLEDs having a pilot line operational since 2008 and we aim to secure our leadership in this technology. Q: OLED lighting promises great efficiency, but the currently available panels are far from fulfilling this promise - even your efficient panels announced in January are only 20lm/W. Why is that? When can we expect OLED lighting panels that can compete with CFL or LED lamps? OLED technology is a developing technology. At this moment we are approx. 3 to 5 years behind LED. In the years to come we expect to see a dramatic increase in efficiency as well as in performance. Q: Back in April 2009 you announced that flexible, transparent and color-tunable OLEDs are being researched. Can you update us on those three exciting areas? 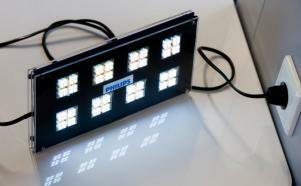 Philips is looking into all aspects of what you can do with OLEDs. Research continues while we speak into all directions with good progress. At the same time, Philips is committed to deliver excellent performance and quality lighting products. We will therefore not rush to market, before we can ensure excellent products in any new technology. However, we are on a very promising way since our panels and modules live up to our expectations. Q: Many believe that if you want to go beyond 50lm/W or so you have to use phosphorescent based materials. Is that your view as well? Are you working towards such panels? We are researching all available materials to ensure that we deliver highest quality and performance to our customers. However, besides material aspects other areas, like e.g. light outcoupling are also very important for increasing efficiency. Q: GE and Konica-Minolta are actively pursuing printed OLEDs, as a way to make cheaper. Will you go down that route too? 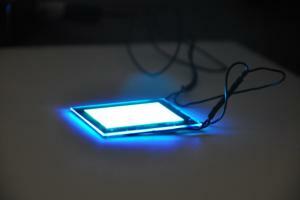 Printing of OLEDs is an exciting vision, but is also linked to many new challenges and problems. We are currently engaged in research in that direction, but it is too early to say, if and when this is a viable technology. Q: Where do you see the lighting market in 5 years? What role will OLEDs make? What role will Philips make? In 2015 we expect the OLED to have arrived and to be accepted in the general lighting market as a new source next to LEDs and traditional light sources. OLED will be available as decorative lighting sources for the high- and medium-end marketplaces and they will be available in larger series. We also expect to see first general applications in architectural lighting. In system performance OLEDs will be on par with other solutions by that time and Philips aims to be the leader in OLED lighting. Kristin: thanks again for your time and for this interesting interview. I wish you (and Philips) a marry Christmas and a happy new year!